1. 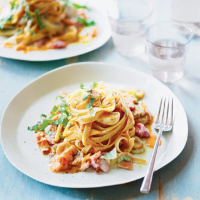 Cook the tagliatelle in boiling water for 10 minutes, then drain and return to the pan. 2. Meanwhile, heat the oil in a frying pan and fry the onion and bacon together for 5 minutes. Add in the mushrooms and cook for a further 2–3 minutes. 3. Stir in the soup and the mascarpone and season. Stir into the pasta, scatter with the basil and serve.